Heartbreaking as it is beautiful, calm as it is chaotic, grand as it is minimalist; Alfonso Cuaron returns to his Mexican New Wave roots and directs the most personal picture of his career. Reaching new heights as a master of cinema, Roma is undoubtedly one of the best features of the year if not the best and is a must see for anyone with any remote interest in the ever-changing landscape of film. Returning to direct a full length feature for the first time in five years since the outstandingly well received Gravity (2013), Alfonso Cuaron has once again outdone himself with his latest picture, Roma. 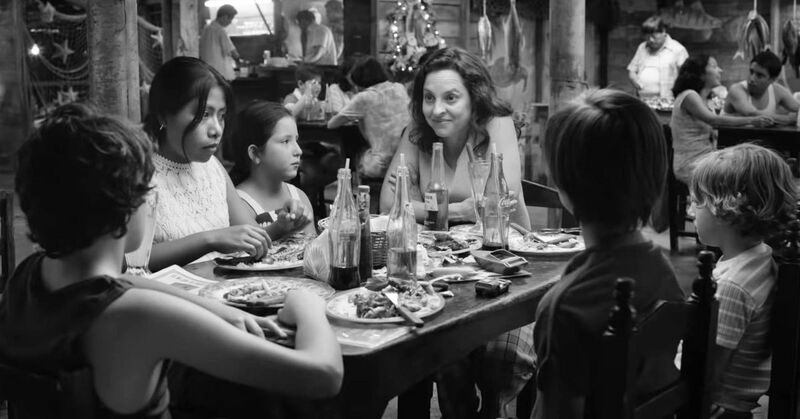 Telling the story of Cleo, the maid of a middle class white family in Mexico City during the early 1970s, Roma goes to new lengths in terms of personal, family orientated story telling. Set amidst the backdrop of political turmoil within the city and the breakdown of the family of which Cleo is employed, Roma tells many stories, some of which are small and barely significant, others grand and life-changing, all of which are seen through the eyes of Cleo. Throughout all these stories however, Cuaron manages to never lose sight of Cleo’s personal relation to every event. Episodic in nature, the multiple set pieces of the story all represent key moments in Cleo’s life and all match the value with the smaller moments that fill up the gaps between the bigger events. It is simultaneously heartbreaking and uplifting to witness, and once the final credits roll, you’ll feel as though you were right there with her, through everything. Yalitza Aparicio portrays Cleo and does an outstanding job. Having never acted on screen before her debut is a masterpiece of subdued minimalism. Every tear feels real, every smile genuine, it is though she really was Cleo. Cuaron’s decision to include her seems obvious in hindsight of watching the film but it is a stroke of genius albeit a risky one. Having an unrecognisable actress to portray such a central role makes perfect sense in a film like this. Cleo feels real because there is no barrier of familiarity between the audience and the actress portraying her and Aparicio is fantastic considering her lack of experience. Bolstering the cast also is Marina de Tavira, an accomplished Mexican stage actress, portraying Sra. Sofia, the mother of the house. Sofia begins as a character in the background but as the film goes on becomes more central as she herself experiences an intense personal struggle alongside Cleo, even if the two struggles are naturally unrelated. The relationship between the two characters goes beyond employer and employee made clear with fleeting glances and bursts of emotion that represent respect and admiration for one another. Cleo at times feels like the oldest child in the house rather than simply the maid, as she has little authority over the children and instead plays with them and takes the brunt of the punishment when they misbehave which naturally leads to a Mother/Daughter dynamic between the two leads that gives great weight to the final climatic scene. Visually Cuaron has never failed to impress but once again has reached new heights in his experimental visual style. Opting to do the cinematography himself for this picture instead of teaming up with longtime cinematographic partner Emmanuel Lubezki, Roma‘s resulting visual style is incredibly subdued in appearance, but is entirely complex when you look deeper. Famous for his long takes the visuals of this film are a long way from the grand set pieces of Gravity or the heart pounding action sequences of Children of Men (2006) but is instead more akin to the personal, yet removed, slow sweeping shots of Y tu Mama Tambien (2001). Slow panoramas dominate the proceedings and are incredibly effective at allowing the world to be bigger than just Cleo and her family, situating the central characters in natural places but allowing the camera to show so much more. It is as though one could focus the camera in on any of the subjects within a scene and have an entire story worthy of its own emotional arc told by their movements, actions and emotions. It is utterly wonderful to witness and undoubtedly worth all the countless hours that must have gone into choreographing every scene. One feels as though Cuaron had a certain amount of breathing room with Roma that he lacked with Gravity and Children of Men. That is not to say those films are lacking in any way because of that, but there is a certain Hollywood sheen that gets put over the top of grand adventure movies such as they. However with the ever growing budgetary assets of streaming services such as Netflix, certain filmmakers have great opportunity to really fully explore the styles of film-making that they wish to pursue. Roma represents a new Renaissance for those involved in the industry. Without the pressure of selling tickets and filling theatre seats, services such as Netflix have the ability to give great filmmakers the freedom that they need to truly flourish in a world where mainstream “old world” large scale production companies and distributors are unable to do so. Roma is certainly a contender for best film of the year and even further a contender for Cuaron’s best work to date. It is emotional, subdued, grand, heartfelt and above all else, real which upon reviewing Alfonso Cuaron’s backlog, might just be all he was trying to do in the first place.